Department, of Medical Microbiology Ahmadu Bello University Teaching Hospital Zaria. Department of Parasitology and Entomology Ahmadu Bello University Zaria. Department of Human Anatomy Ahmadu Bello University Zaria. Background: Intestinal parasites and helminthic infection has posed medical changes to the developing word. There is therefore need to source and develop local drugs or herbs to combat this menace. Aims and Objectives: This study therefore examined the anthelminthic activity of ethanolic leaf extract of combretum molle in vitro on the ova of Hookworm and Haemonchus contortus. Materials and Methods: One drop of the extract mixed 5 drops of distilled water was added to 6 drops of faecal samples on a microtiter well and incubated for 14 days at 260C, using water as control. The activity was assessed by comparing the number of ova present after a period of 2 weeks for both the extract and water. The result showed that there was only one egg (non -embryonated) of hookworm observed in the well with the extract. For the Haemonchus contortus in the well with extract, there as one egg,12 unembryonated eggs, 13 dead larvae. For the control(water), there was no positive effect on the hookworm and the Haemonchus contortus. Conclusion: Result from this study shows that ethanolic leaf extract of combretum molle was effective against the ova of the hookworm and the Haemonchus contortus and can be a possible anthelmentic agent. Intestinal parasites and helminthic infection has posed medical changes to the developing word. Resistance to antibiotics is becoming a serious problem worldwide. The discovery of new and effective antimicrobials and/or resistance modulators is necessary to tackle the activity of spread of helminths. Infections with helminths are among the most widespread diseases worldwide and the reason for considerable morbidity, mainly in populations from less developed countries of Sub-Saharan Africa, the Americas, and Southeast Asia (Hotez et al.,2008). Recent investigations estimated the number of people infected with the most common parasitic nematodes Ascaris lumbricoides, Trichuris trichiura, and hookworms (Ancylostoma duodenale and Necator americanus) to be more than 1.7 billion worldwide, including 100 million infections in West Africa (Pullan et al., 2010). Extensive measures have been undertaken by the WHO to provide effective and low-cost treatments for the inhabitants in endemic areas, which have successively led to a decrease in the morbidity and prevalence of intestinal helminthiases (Humphries et al.,2012). In most cases, albendazole is the deworming drug of choice, however, mebendazole, pyrantel, and levamisole are also classified as essential medicines (WHO,2013). Nevertheless, the number of approved anthelmintic drugs the societies are relying on is very limited and especially large-scale preventive applications bear the risk of resistances to emerge (Vercruysse et al.,2011). In veterinary medicine, this is already the case where worldwide resistances of parasites of livestock have increased to a dramatic degree within the last years (Kaplan and Vidyashankar,2012). Despite the availability of conventional drugs, traditional medicine, often based on medicinal plants, plays a crucial role in the treatment of helminthic infections. As indicated by a recent field study, many African patients prefer to consult traditional healers or herbal practitioners for this indication (Agyare et al.,2009). More than 300 species of plants have been reportedly used in traditional control of human and animal helminthosis in Africa (Nwude et al.,1998). Combretum molle of the combretacae family is used to treat human ailments including abdominal discomfort, body pains, respiratory discomfort, cods and fevers, ear and eye ailments, schistosomiasis, hookworms, dysmenorrhea and infertility in women, leprosy, syphilis, microbial infections and general body weakness (Ademola and Eloff, 2010). Helminthiasis is a major limitation to the livestock industry in Africa. Haemonchus contortus is the singular most important helminth responsible for major economic losses in small ruminants. The high cost of anthelmintics to small farmers, resistance to available anthelmintics and residue problems in meat and milk consumed by humans further complicates matters. Haemonchus contortus is the single most important constraint to sheep production in South Africa (Vatta et al.,2001) with estimated direct and indirect economic losses of US $45 million (I.G. Horak personal communication quoted by Waller, (2006). The cost of controlling helminth infestation is also very high globally with chemotherapy remaining the most widely used method of treatment. Unfortunately, the excessive use of these drugs when not necessary, in addition to their use at incorrect doses, has resulted in the wide scale emergence of resistance in this parasite. The use of plants and plant extracts as a possible source of new anthelmintic has received more interest in the last decade. This study therefore aim to study the anthelminthic activity of Combretum molle (velvet bush willow) against ova of hookworm and Haemonchus contortus. This study was conducted in the department of parasitology and entomology, faculty of veterinary medicine Ahmad Bello University, Zaria. Positive stool sample was collected from Ahmad Bello University Teaching Hosital Zaria. Plant collection. Five-kilogram leaves of Combretum molle was collected in Zaria and identified in the biological science department of Ahmad Bello University, plant extraction. The leaves were air dried (290C) under shade and grinded sing pestle and mortar into fine powder as described by Onyeyili et al.,2001. 150g of the powdered sample was extracted with 2.5L of 96% ethanol using cold maceration (percolation) method. The filtrate was evaporated and the extract obtained used. One part of Acacia was mixed with 5 parts of the extract.one drop of the mixture as introduced into microtiter well for culture and left for two weeks using water as control. 0.1ml distilled water was added to 1.2ml positive faecal sample and 0.2ml extract. Culture was observed for ova microscopically on day 7, 10 and 14 post incubation respectively. 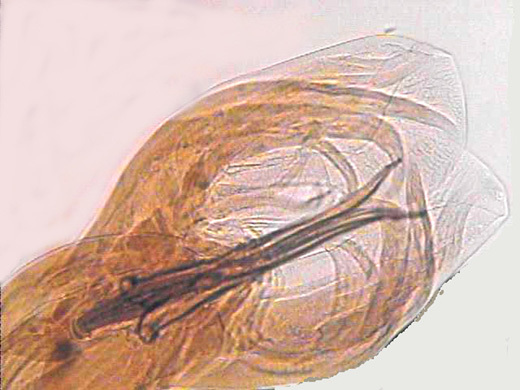 The results from this study shows that at the end of 14 days, the extract at 0.2ml had an adverse effect on the ova of Hookworm and the egg, and larvae of Haemonchus contortuus. This was observed by the absence and dead of the ova and larva. which implies that the extract has anthelminthic effect. 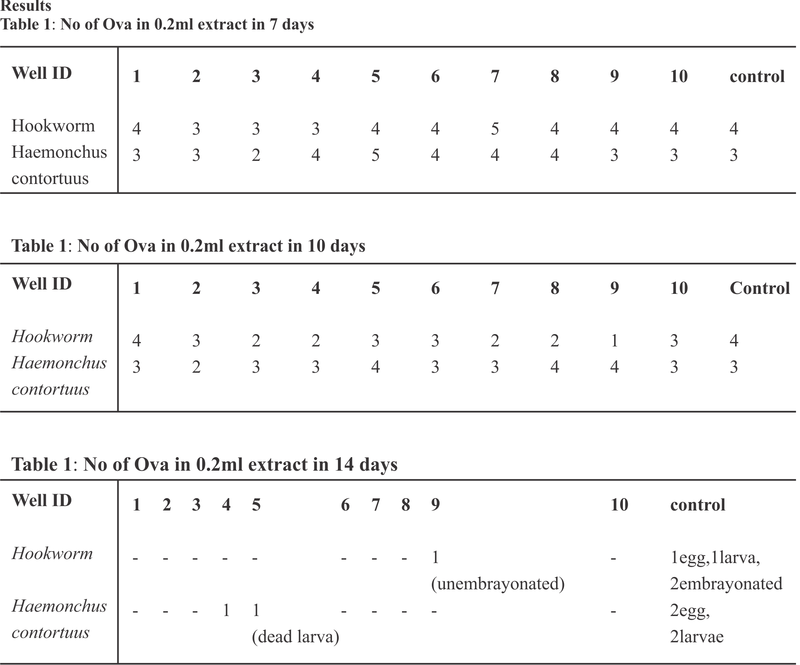 While in day 7 and 10, the extract did not reduce the number of the ova and larvae significantly the control only with water did not show any anthelminthic effect rather, the ova hatched to larvae. These findings are similar with previous investigations on lethal anthelmintic effects against a variety of nematode species, including adult C. elegans Mohamed et al (2000) and L3 larvae of Toxocara canis Kiuchi et al (2000). Also, the activity against C. elegans (L4 larvae/ young adults) of a plant extract from Combretum mucronatum by Schum. & Thonn. (Combretaceae) leaves has been confirmed in vitro (adult worms) and in vivo against Trichuris muris and against adult stages of A. ceylanicum, Spiegler et al., (2015) while the same extract was inactive against third stage larvae of the hookworm Kone et al., (2012). This inactivity is probably caused by the sheath protecting the free-living L3 larva persevering in soil, which is unlikely to be penetrated by large polar molecules such as proanthocyanidins. T. et al., (2012). Similarly, Adamu et al (2013) reported that the plants extract generally had better inhibition activity on the eggs than on the larva of H. contortus based on the EC50 values recorded. This is contrary to report by Ademola where they had better activity for the larval inhibition compared to the egg hatch assay. In comparison to work undertaken using extracts of other plant species, the activity shown by the three plants with the best activity were in the same order of activities found by Bizimenyera et al., (2006) using Peltophorum africanum leaf, bark and roots as well as extracts of Coriandum sativum on eggs and larval development of H. contortus Eguale et al.,(2007). Bizimenyera et al., (2006) recorded an EC50 of 0.62 mg/ml and 0.72 mg/ml for the leaf acetone extract for the EHA and LDT assays respectively. This is in the same order with values of 0.62 and 0.64 mg/ml recorded in the EHA and LDT for H. trifoliata in the current study. The EC50 of H. trifoliata was lower than the acetone leaf extracts of Combretum molle 0.87 mg/ml and 0.60 mg/ml for the EHA and LDT respectively (Eloff McGaw and Eloff, 2008). The weak activity recorded by M. azedarach (EC50 = 10.96 mg/ml) agrees with Maciel et al., (2006) in Brazil where they reported an LC50 of 9.18 mg/ml with the leaf ethanol extract of the plant. It is encouraging that despite the difference in geographical location and organic extractants used, similar bioactivity was obtained for related species. We are grateful to the Management and Laboratory staff Ahmadu Bello University Teaching Hospital Zaria, and Department of Parasitology and Entomology, Faculty of Veterinary Medicine Ahmadu Bello University for permission, support and cooperation during the work. 4. Humphries D, Nguyen S, Boakye D, Wilson M, Cappello M (2012). The promise and pitfalls of mass drug administration to control intestinal helminth infections. Curr Opin Infect Dis; 25: 584–589. 6. Vercruysse J, Albonico M, Behnke JM, Kotze AC, Prichard RK, McCarthy JS,Montresor A, (2011). Levecke B. Is anthelmintic resistance a concern for the control of human soil-transmitted helminths? Int J Parasitol Drugs Drug Resist; 1: 14–27. 7. Kaplan RM, Vidyashankar AN (2012). An inconvenient truth: global worming and anthelmintic resistance. Vet Parasitol 2012; 186: 70–78. 8. Agyare C, Asase A, Lechtenberg M, Niehues M, Deters A, Hensel A. (2009). An thnopharmaco-logicalsurvey and in vitro confirmation of ethnopharmacological use of medicinal plants used for wound healing in Bosomtwi-Atwima-Kwanwoma area, Ghana. J Ethnopharmacol 125: 393–403. 10. Okpekon T, Yolou S, Gleye C, Roblot F, Loiseau P, Bories C, Grellier P, Frappier F, Laurens A, Hocquemiller R. (2004). Antiparasitic activities of medicinal plants used in Ivory Coast. J Ethnopharmacol 90: 91–97. 11. Annan K, Amponsah IK, Jato J, Nooni IK. (2013). Pharmacognostic evaluation and physicochemical analysis of Paullinia pinnata L. (Sapindaceae). J Pharmacogn Phytochem 2: 203–208. 12. Chabra SC, Mahunnah RLA, Mshiu EN. (1999).Plants used in traditional medicine in Eastern Tanzania. V. Angiosperms (Passifloraceae to Sapindaceae). J Ethnopharmacol 1991; 33: 143–157. 13. Tamokou Jde D, Chouna JR, Fischer-Fodor E, Chereches G, Barbos O, Damian G, Benedec D, Duma M, Efouet APN, Wabo HK, Kuiate JR, Mot A, Silaghi-Dumitrescu R. (2013) Anticancer and antimicrobial activities of some antioxidant-rich Cameroonian medicinal plants. 8:e55880. 14. Melendez PA, Capriles VA. (2002). Molluscicidal activity of plants from Puerto Rico. Ann Trop Med Parasitol 96: 209–218. inflammatory activities and phytochemical screening of the leaves extract of Paullinia pinnata (Sapindaceae). J Chem Pharm Res; 3: 351–356. 16. Zamble A, Carpentier M, Kandoussi A, Sahpaz S, Petrault O, Ouk T, Hennuyer N, Fruchart JC, Staels B, Bordet R, Duriez P, Bailleul F, Martin-Nizard F.(2006) Paullinia pinnata extracts rich in polyphenols promote vascular relaxation via endothelium-dependent mechanisms. J Cardiovasc Pharmacol 47: 599–608. 17. Annan K, Houghton PJ. (2010)Two novel lupane triterpenoids from Paullinia pinnata L. with fibroblast stimulatory activity. J Pharm Pharmacol; 62: 663–668.